A 7,600-ton KDX-III Aegis Destroyer is set to be permanently homeported to the new base which spans nearly 500,000 square meters with docks running some 5 kilometers. The dual-use base is capable of simultaneously docking up to 20 combat ships and two of the biggest cruise ships, larger than 150,000 tons. 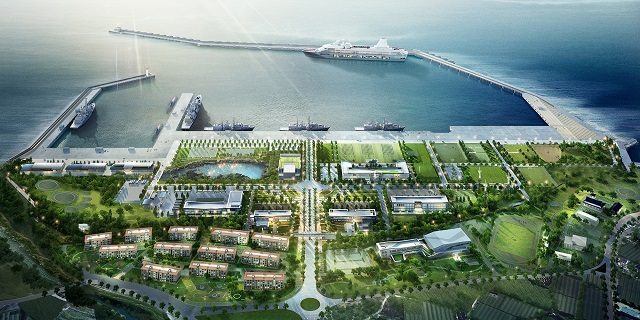 With the relocations, Jeju will host more than 3,000 Navy troops as well as the Submarine Force Command. The base could see more destroyers in the future as South Korea's Joint Chiefs of Staff( JCS) decided in 2013 to increase the number of its Aegis destroyers from the current three to six by 2027 to strengthen its maritime combat capabilities. The ROK Navy stressed the new base will dramatically enhance the Navy's ability to counter North Korea's potential provocations at the sea borders both in the west and the east. 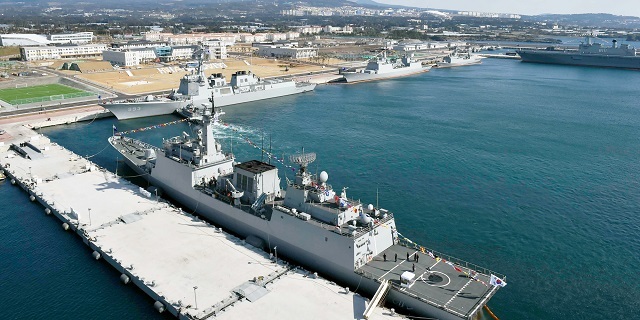 The new naval compound also has in mind the mission to defend Ieo Island, known as Socotra Rock, a strategically important South Korean submerged rock located nearly 300 km southwest of Jeju. China has previously laid claims to the resource-rich rock, which South Korea controls with the presence of its maritime research center there. Partially designed by the South Korean Ministry of National Defense, built by Hyundai Heavy Industries and Daewoo Shipbuilding & Marine Engineering, the Sejong the Great class Destroyers are the largest surface combatants in the Republic of Korea Navy. The 3 vessels of the class were built as part of the KDX-III project to strengthen ROK Navy defense against North Korea and other emerging threats as well as provide the ROK Navy with true blue water, ocean going capabilities.